rady Oberg seemed to be the perfect American veteran. He had always wanted to join the military and in 2009, he did. He served in the 10th Mountain Infantry Division. He was deployed to Afghanistan as a part of Operation Enduring Freedom. He loved being an American soldier and took great pride in being a part of the military. Because of his skills and leadership abilities, he was chosen to be a sniper. He married Katie McCollum in February 2012 wearing his dress blues. After his deployment, they lived at Fort Polk, Louisiana, until he finished his service. They then returned to Minnesota. And on August 6, 2015, Brady Oberg committed suicide. The 124th Regiment returned home from this deployment with no fatalities. It has since lost 11 combat veterans to suicide. Oberg’s sister Tracy Oberg Dunham says, “We want people to know our story. We don’t focus on the suicide part, we don’t focus on the last ten seconds of insanity. 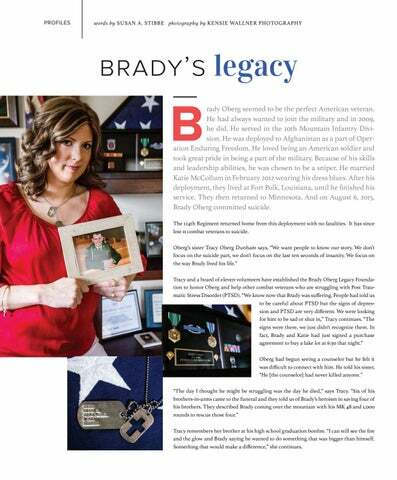 We focus on the way Brady lived his life.” Tracy and a board of eleven volunteers have established the Brady Oberg Legacy Foundation to honor Oberg and help other combat veterans who are struggling with Post Traumatic Stress Disorder (PTSD). “We know now that Brady was suffering. People had told us to be careful about PTSD but the signs of depression and PTSD are very different. We were looking for him to be sad or shut in,” Tracy continues. “The signs were there, we just didn’t recognize them. In fact, Brady and Katie had just signed a purchase agreement to buy a lake lot at 6:30 that night.” Oberg had begun seeing a counselor but he felt it was difficult to connect with him. He told his sister, “He [the counselor] had never killed anyone.” “The day I thought he might be struggling was the day he died,” says Tracy. “Six of his brothers-in-arms came to the funeral and they told us of Brady’s heroism in saving four of his brothers. They described Brady coming over the mountain with his MK 48 and 1,000 rounds to rescue those four.” Tracy remembers her brother at his high school graduation bonfire. “I can still see the fire and the glow and Brady saying he wanted to do something that was bigger than himself. Something that would make a difference,” she continues. June.July 2017 | Celebrating all things woman! Area Woman is the first known free-released women's interest magazine in the country.